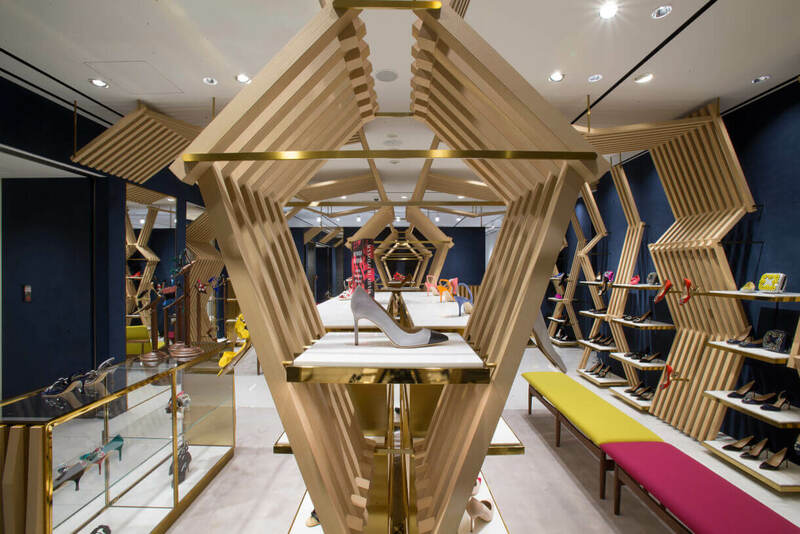 Manolo Blahnik Ginza Six | Nick Leith-Smith. London Architect. Ginza 6 is heralded as new vision of luxury, reflecting the coming together of art, architecture in a contemporary shopping experience. Embracing this with a space which not only evokes the brand’s unique character but which reflects a strong sense of local identity. The flagship is contextualised in deference to Japanese mastery for interpreting traditional cultural forms in exciting new ways. The breadth and quality of material, craftsmanship and architectural influences are unrivalled by any other culture. The focal element is a timber installation, inspired by the infamous Japanese timber construction and joinery but realized here in crisscrossed folded wooden slats. Interlacing they connect walls and traverse across the ceiling, imperceptibly supporting shelves and acting as hangers. It is at first sight both primitive yet considered; functionally dynamic and playful much like the brand itself. Cleverly fusing the industrial with the ornate, feature walls are hung tiles in an undulating curve pattern inspired by the gingko leaf. Dramatic contrast comes in a back wall in painterly blue, inspired by traditional Japanese indigo plant dye.